One of the greatest wrestlers of his generation, Keiji Mutoh is known the world over for both his work as himself and his alter ego, the Great Muta. In his career he has held 12 titles in five different promotions spanning three countries. Keiji Mutoh has wrestled against the best America and Japan has to offer over his 25 year career, including Antonio Inoki, Mitsuharu Misawa, Kenta Kobashi, Sting, Ric Flair, Ricky Steamboat, Steve Austin, Hulk Hogan, Big Van Vader, and countless others. Mutoh has main evented at the Tokyo Dome on numerous occasions, including two straight main events against Takada that drew a packed house. A true living legend, Mutoh has accomplished all there is in professional wrestling but continues to wrestle and entertain his fans every week in Japan. Currently, Keiji Mutoh is an active wrestler in All Japan Pro Wrestling. Mutoh took over as President in 2002 when the promotion was floundering, and after a beginning rocky period, since 2005 the promotion has consistently put on entertaining cards and has grown enough that they re-entered Sumo Hall and have gotten a number of sponsors. Mutoh still wrestles in All Japan both as himself and as Great Muta, mostly wrestling in a supporting role. He remains one of the most popular wrestlers in Japan due to his in ring ability and charisma. 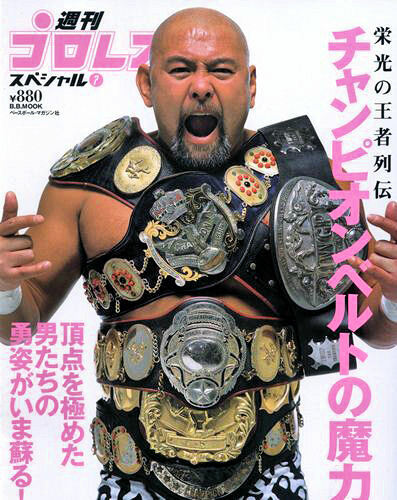 In 2008, Keiji Mutoh won the Wrestler of the Year Award in the Tokyo Sports Newspaper, as he became only the second wrestler in history to hold the IWGP Heavyweight Championship and Triple Crown Championship at the same time. 25 years after debuting, Mutoh isn't finished yet and is sure to entertain for many more years to come.